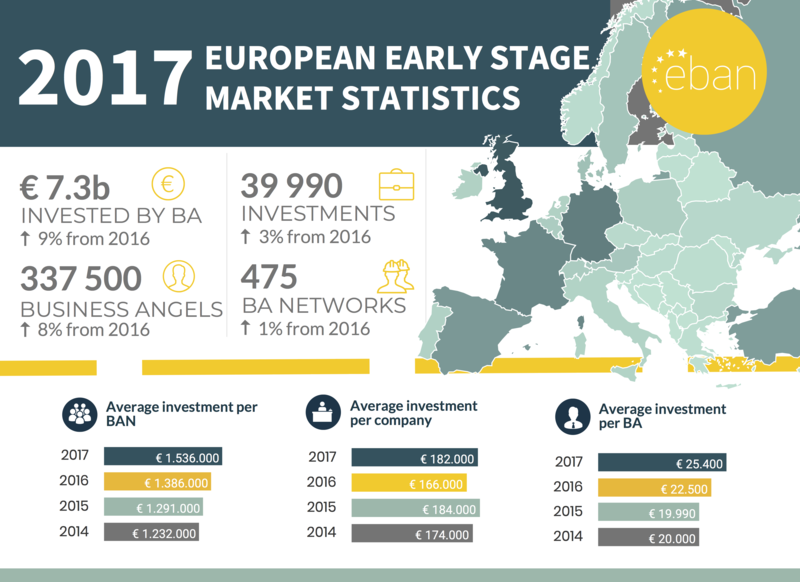 EBAN, the European Trade Association for Business Angels, Seed Funds and Early Stage Market Players, is delighted to announce the EBAN 2017 Annual Statistics Compendium – Europe’s most extensive annual research on the activity of business angels and business angel networks. The Statistics Compendium provides information on the overall early stage market, on how business angel networks operate and insights into their investment attitudes and demography. In 2017, the early stage investment market in Europe totaled 11,4 billion euros, out of which 7,3 billion euros was invested by business angels, an increase of 9% from 2016! EBAN’s Statistics Compendium is based not only on the information provided by European business angel networks, Federations of BANs, individual business angels and other validated early stage investors who responded to EBAN’s Survey, but also based on data published in national and regional research studies on angel investment and EU Commission publications, Dealroom.co, Crunchbase, Zephyr (Bureau va Dijk) databases, governmental BA co-investment funds and fiscal incentive reports.